Imagine the two foremost figures of Latin American letters having a conversation on the politics of the region, and you being able to listen. Well, that was the scene last night at 50 McCosh on the Princeton University campus. Vargas Llosa cited Uruguay’s economic success as a model for the rest of Latin America. He said that the country has seen very liberal social reforms, including gay marriage and gay rights. “Not liberal in the American sense,” he added to the audience’s laughter. More importantly, Vargas Llosa enumerated, Uruguay has respected its constitution, has independent strong institutions, observes the rule of law and welcomes foreign investment. Krauze is not as optimistic on Mexico, pointing out the country’s recent lack of economic growth and the absence of a moderate left. I had the pleasure of asking what the Pacific Alliance may mean for the hemisphere . Vargas Llosa said it will be the only alliance that will endure; Krauze pointed out “best yet, like the name says, it’s pacific”. 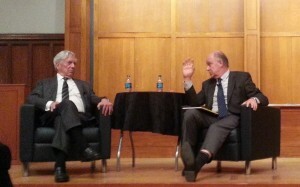 It was a splendid evening, bringing many insights from two of the greatest minds in the contemporary world.